The piano restoration center has over 40 years of experience in piano restoration, technical and tuning services for concert use and in the home. The facility is open for hands-on technical sessions, classes and seminars. The piano restoration center is a supplier of concert instruments and services to many churches, schools and universities throughout the United States, and a supplier of quality new and restored instruments for the musically discerning buyer nationwide. We specialize and take great passion in the restoration of vintage pianos built by Steinway, Mason & Hamlin, Bluthner, Knabe, Chickering, Baldwin and many other pianos. The piano restoration process starts with a high quality, hand crafted grand piano built by the original manufacturer to a high degree of precision and nearly perfect design. 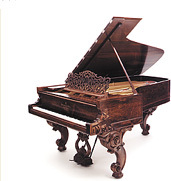 The piano restoration program incorporates the original integrity of the piano by maintaining the quality of the instrument, while having the creative ability to enhance an original design as necessary or desired. A properly restored/rebuilt piano will regain its original grandeur and value, often superior to a new instrument of comparable value. Quality replacement materials coupled with high quality workmanship will result in a restored instrument that will last as long or longer than the original piano. Rebuilding a good, quality made piano will increase its value in most cases more than two-fold. Not only can piano restoration be a financial investment, it can also supply a lifetime of music enjoyment that can be passed down from generation to generation. Because of the piano restoration center's combined experience, expertise and the use of quality materials, restored pianos are an investment of a lifetime.